StartUPer is now available in English! Главная / Новости компании / StartUPer is now available in English! Go od news for everyone! We translated StartUPer into English. Now you can develop your skills not only in the flexibility of business thinking, but also improve your English-speaking skills! Do you know what StartUper is all about? StartUPer is a game for the development of entrepreneurial thinking among schoolchildren and students. It is designed to teach them think flexibly, variously and apply improvisation both in business and in everyday life. This game is not about developing business plans, investor search, loans, etc. It is about an informed approach to business, the ability to rely on your strengths and perceive yourself in the market. It is about a personal brand and the creation of a unique, competently packaged product/service. It is about the ability to see opportunities and instantly adjust to the situation. Common to many adults model “School-University-Stable Job for years” has lost its relevance. In order to be successful in life and business it is important to learn and to have a will to constantly improve your abilities, skills and talents. The board game StartUPer teaches students to quickly navigate the market situation, to adapt to changing conditions and to evolve. The education program for students implies the creation, elaboration and defence of business projects. The game StartUPer allows to do this in an informal, comfortable environment at any stage of the educational process. It can be used to initialize a business idea, to detail it or to evaluate the result. In the game you can make mistakes, go beyond the usual and everyday, react differently. And in the end get an interesting breakthrough product/service. StartUPer gives the opportunity to look at the business project from different angles, adapt it to the needs of the target audience and think over the promotion strategy. The game StartUPer teaches students to adjust and get benefit for themselves in any situation, allows participants to develop and strengthen knowledge and skills, find new niches for the development of a business project, competently present and sell it or make it recognizable. Areas of use of business game StartUPer: economics and business fundamentals lessons for students of the 10th, 11th grades; classes in the disciplines of “Fundamentals of Entrepreneurship”, “Fundamentals of Project Activities” for students of colleges, technical schools and universities; development of individual projects by high school and university students, etc. 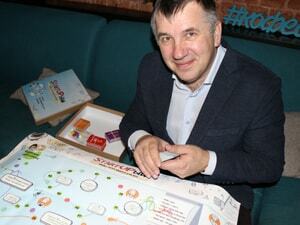 Check out our russian version of StartUPer. Если у вас остались вопросы по бизнес-игре StartUPer или вы хотите ее приобрести и оплатить заказ по безналичному расчету, то заполните, пожалуйста, форму обратной связи, и мы свяжемся с вами.